As important elections draw near in many places throughout the developed world, opposition parties are making political capital from the embarassment caused to governments, by the over zealousness of the extreme AGW fraternity, so called AGW deniers are in a confident mood, hopeful now that the CO2 debate may be over or at least moderated, for human civilisation that may not be such good news, because our problems are still there waiting to be solved, lets pretend for a moment that the CO2 debate had never even begun, the other problems are still there slapping us in the face every morning, population growth and the effect that this will have on our energy supplies, this is the elephant in the room, sometimes whispered about in the CO2 debate, ( the one we are pretending didn't start ), we already know that the quality of life we enjoy in the first world has been built on the cheap energy we derive from burning oil and natural gas. This may be the most important graph in the world, and the measures we take now will greatly influence whether the standard of living trend continues to climb, levels off or plummets. Cutting the link between quality of life and energy consumption as well as energy consumption and CO2 emissions, is the key, and this can only be done through increased efficiency. With a combination of increased fossil fuel efficiency and more extensive use of wind/solar/nuclear power, I think we can crack this. Definitely, peak oil is of great importance. I don't think that there should be jostling over what gets to be the big issue: climate change or peak oil. It is plausible and I think very likely that we are facing multiple crises at the same time. How do you quantify standard of living demand? The populations of the developing world all aspire to a similar standard of living enjoyed by the developed world, medical care, nutritious food, comfortable housing, ipods, Tv's, refridgerators and time for leisure pursuits rather than the pursuit of survival. You may have noticed that the green plot is now the steepest and brings forward peak oil. The abiotic theory holds that there must be nearly limitless pools of liquid primordial hydrocarbons at great depths on Earth, pools that slowly replenish the reservoirs that conventional oil drillers tap. Meanwhile, however, the oil companies have used the biotic theory as the practical basis for their successful exploration efforts over the past few decades. If there are in fact vast untapped deep pools of hydrocarbons refilling the reservoirs that oil producers drill into, it appears to make little difference to actual production, as tens of thousands of oil and gas fields around the world are observed to deplete, and refilling (which is indeed very rarely observed) is not occurring at a commercially significant scale. Yup - the abiotic oil theory is still missing just that tiny little thing called evidence. Damn, looks like I was fooled by a google search again, thanks for clearing that up. The Russians can be crafty spoofers. It's a superficially attractive theory, but it dates from Cold War Russia, where there was something of a tendency to promote alternative theories (such as Lysenkoism) purely on the basis that capitalist science couldn't be right. ...it's Young Dan, isn't it? Well heck, that durn pencil work sure convinced me. Damn, I could feel the planetary IQ dropping as I listened to that. I'll sit on the fence until a half decomposed crustation blocks up a pipe line in Saudi Arabia. No, and joking aside in fairness to the OP I would tend to agree that it is an Important graph because it shows us that the world is heading for an increase in industrialisation which is not a good thing for the enviroment, aside from CO2 levels there is going to be an increase in all forms of toxic pollutants, it's not looking good for life on earth, air pollution will eventually cause a a massive dimming effect, the future is not bright. Increasing industrialisation does not have to have the outcome you describe, provided we move from cpen to closed production cycles we can industrialise to our hearts content. Peak oil is a movable feast, however the increasing demand for standard of living improvemements coming from the developing world will move it much closer, the problem here is that we are not developing the alternative energy sources fast enough in order that there is a seemless changeover from oil dependency. Peak oil is not the problem, energy supply is. An economy without an adequate stable energy supply is a dying economy. And as we have seen with our own eyes, an economy with an excess of avalable energy becomes very rich, very quickly. There is no record of hard necked politician crustations existing at any time in the past, only such a creature could possibly resist decomposure over such long timelines, would you like to buy a cushion for your fence, I fear for your comfort, having such a long wait ahead of you. The graph shows the very stark reality that our standard of living and economic prospects are very securely tied to the availability of energy and that energy supply is now threatened as more and more countries chase a dwindling supply of oil and gas. 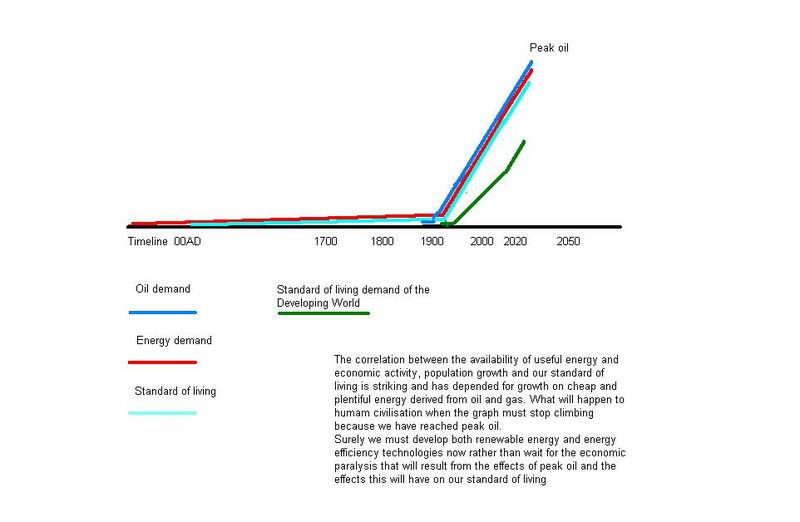 Ireland presently imports 97% of our energy so the implications of the graph are very real. That estimate has since been upgraded to 2000 TW/hrs/yr, due to improvements in turbine techgnology and we can soon add another 500 TW/hrs/yr from wave and biomass. That is in excess of 10 times Irelands total primary energy demand. So Irelands only problem is getting from 97% dependent on a dwindling resource to becoming a major energy exporter. And gathering that energy will use about 2% of our land area. Oh? More bed-wetting? Concepts like 'peak oil' and AGW are vague/pretentious at best and the green agenda has been throughly infected by the games of politics and money, and is already responsible for the deaths of millions of innocents. Whenever the scaremongers start their little discussions about 'population adjustments' it sends a veritable chill up my spine. Brrrrrrr! Who is wetting the bed, I am pointing out the opportunities for Ireland to build a sustainable industry. I personally do not care if you believe in peak oil or not, perhaps in your worldview the concept of energy begins and ends at the light switch or the petrol pump, this is a political website and our future energy supply is the biggest political challenge we face and renewable energy by its very nature allows everybody to make a few bob, not just the big boys. As far as I am concerned the more people in the world the better, we simply must learn to move from open production cycles to closed ones, for the simple minded that means cutting out the waste and doing things cheaper. While I am sure some of us are touched by your colloquial coaching --"make a few bob" etc., bear in mind the fact that there is a class of environmentalists who are primarily middle-class city-dwellers who know next to nothing about the actual environment, about where their energy or food come from -perhaps it is in fact such environmentalists who are "simple minded" as you put it? The rest of us know better than to buy into green schemes and schemers purporting to have simple solutions and who overwhelmingly IGNORE the hard facts of a highly politicised and monetized global green agenda! I gave up believing in fairy godmothers a long time ago and I dont do ideology, so I will ask you a question without using a bad word like sustainable, is it reasonable to import 97% of something you need, when you can make it yourself. Perhaps it is the green agenda who are responsible for the fact that the dark green line on the most important graph in the world looks like it will get even steeper this year. Oil demand in 2010 will be "sluggish" in the developed world, with emerging markets accounting for any increases and top producers switching supplies to eastern growth markets, the International Energy Agency says. The IEA also warned of possible "downside risks" to economic recovery for members of the Organisation for Economic Cooperation and Development (OECD), a grouping of 30 of the world's richest economies. "Oil demand recovery in the OECD will likely remain sluggish," the Paris-based IEA said in its monthly oil market report. "Demand growth in 2010 derives entirely from outside the OECD," it added. Congratulations to 18 year old Blarney student, Richard O Shea on winning the Young Scientist of the Year competition, his project will do more good in the world than all of the bluster coming from both sides of the climate change debate. His product, a simple biomass stove, will have more effect on CO2 levels and raising the standard of living in the developed world than anything the IPCC or their opponents will ever do. He joins a long list of people who quitely pursue real change in the world and I wish him well in his career, we need more people with vision and drive like him.